Now, you probably think, as I did, that this was a wall cloud. 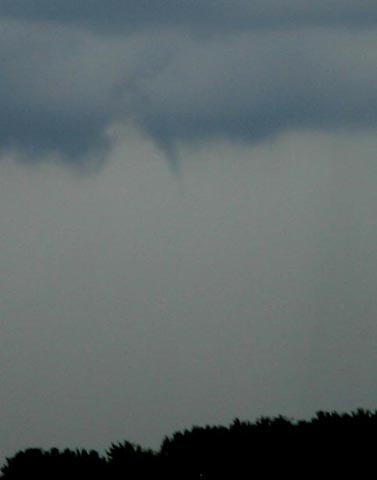 But what it actually turned out to be was the beginning of a process of the base of the storm re-forming at a lower level, as the storm moved into the area where 3-6 inches of rain had fallen the night before. As the storm continued east, the entire base re-formed at this lower level. I assume as the storm moved into the more humid environment - it remained very warm and sticky, even when I poked to within a half mile or so of the heavy rain - the LCL was lower, and this caused the storm to form a new base at a lower level. 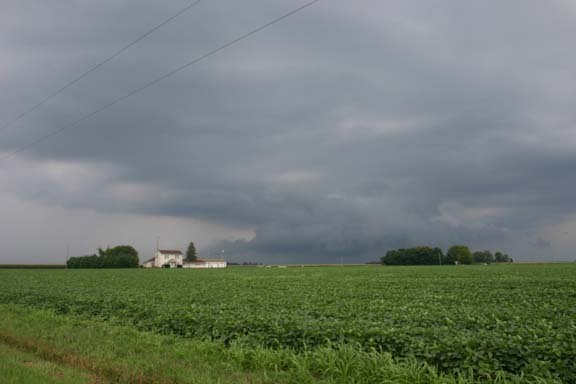 By the time the storm was north and northeast of Decatur, the entire base was down to the level of the base in this feature that looks like a wall cloud. I was on this storm from around 2:00 just northeast of Springfield to around 4:30 ENE of Decatur. But by then it became apparent that all the storm was going to do was produce copious amounts of rain - and flooded roads were becoming more and more of an issue. I had to make one detour where a road was closed due to flooding, and several other places small amounts of water were running over the road. I headed back west on I-72 to Springfield, hoping something would pop in the area west of there where RUC had progged CAPE as high as 4500. That did not happen, as clouds from earlier storms and the southward push of the pre-frontal storms took care of that. This occurred around 7:05 p.m. and persisted until around 7:10. 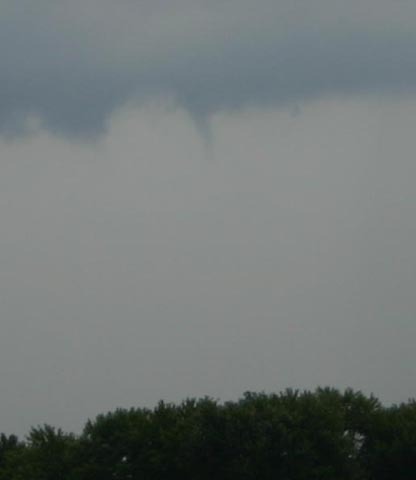 Location of the funnel was southeast of Marine, IL and southwest of Highland. All in all, not a bad chase for not seeing any storms that technically met the definition of "severe."